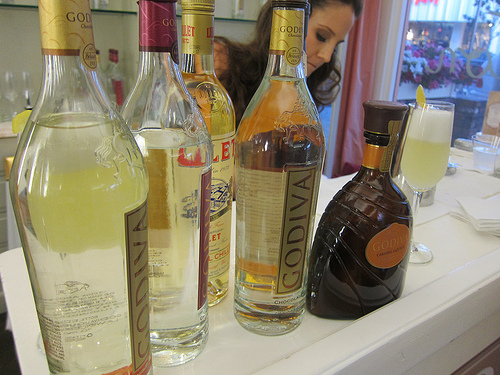 A few weeks ago, I had an opportunity to check out the chocolate infused vodkas from Godiva. I had known about their liqueurs but didn’t realize they’ve been produced a chocolate and chocolate raspberry infused vodka as well. 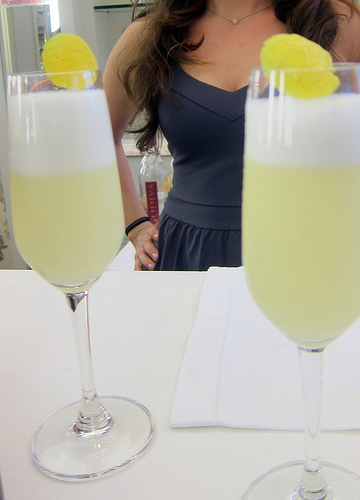 The event featured Miss Speed Rack LA, Kylee Van Dillen‘s cocktails. The first charming cocktail I tried was the Parisian Breakfast (Godiva Chocolate Raspberry vodka, Lillet Blanc, lemon, simple syrup, egg white). Kylee explained this was a light cocktail. It was quite magical and evoked a longing for a city I’ve never been to- Paris. 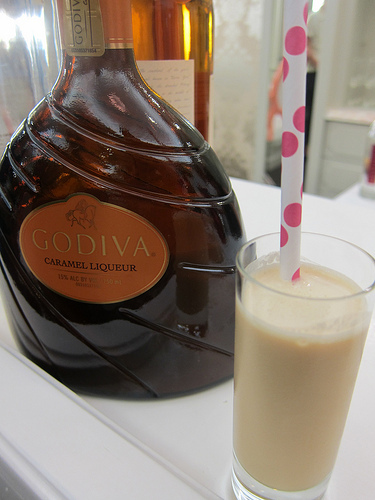 I could see myself at a little French bar nibbling on a piece of chocolate (Godiva, of course) and sipping this. I had this whole afternoon fantasy mapped out but then remembered it was supposed to be breakfast. Ah, the French- so chic. 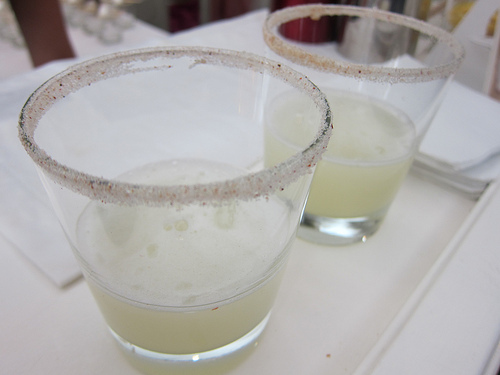 Kylee then showed me her Heartbreaker (Godiva Chocolate vodka, lemon, fresh red jalepeno pepper, rimmed spicy sugar). At first she experimented with infusing the chile pepper for more than a few days but found it would be too spicy. If you would like to do this on your own, infuse the pepper for no more than a day. And that spicy sugar left a pleasant tingle as well. Miniature milkshakes were floating around the party. I loved the fun polka-dotted straws. The shot glass worth was the perfect serving of this delicious boozy milkshake. 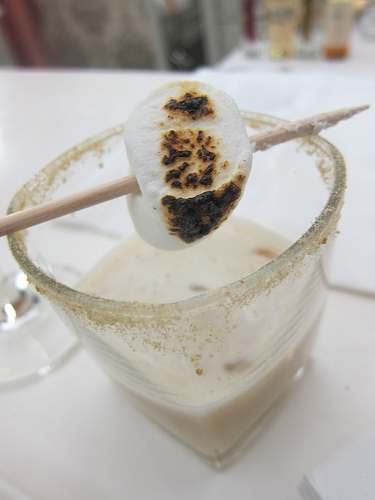 For a dinner party, I could imagine wowing guests with the Smoke Signal (Godiva Chocolate vodka, Godiva Caramel liqueur, Oban 14-Year-Old Whisky, cinnamon graham crackers, marshmallow, coarse sea salt). When guest ordered these, a marshmallow was toasted as the garnish. This drink could lean on the sweeter side but the Japanese whisky brings in a smokey kick. Catch Kylee at the Speed Rack Finals on May 10th in New York. Get your tickets and I’m rooting for her to bring the championship home to LA! This entry was posted in alcohol education, alcohol tasting, bartenders, spirits and tagged cocktails, dessert, godiva, godiva caramel liqueur, godiva chocolate raspberry vodka, godiva chocolate vodka, godiva liqueurs, kylee van dillen, lillet, oban, speed rack. Bookmark the permalink.